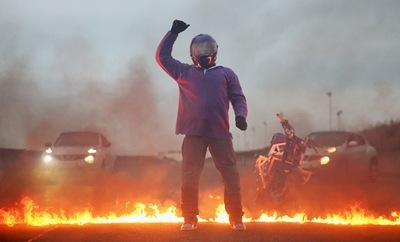 NatWest brings together rugby world cup winner Lewis Moody, daredevil motorcyclist Lee Bowers and world record stunt driver Terry Grant for an epic rugby world record challenge. Lee Bowers must intercept the ball at a speed of over 50mph whilst standing on his motorbike to set a new Guinness World Record. To make things even trickier, the ball is being passed between two Nissan Jukes, on two wheels! It’s fast. It’s furious. It’s rugby like no other.